A SENSO resin floor is a strong floor for the kitchen, resistant to all fluids that may feature in your kitchen, such as water, juice, coffee and wine, but also olive oil, fat and soap. Moreover, design aspects have also been taken into account. 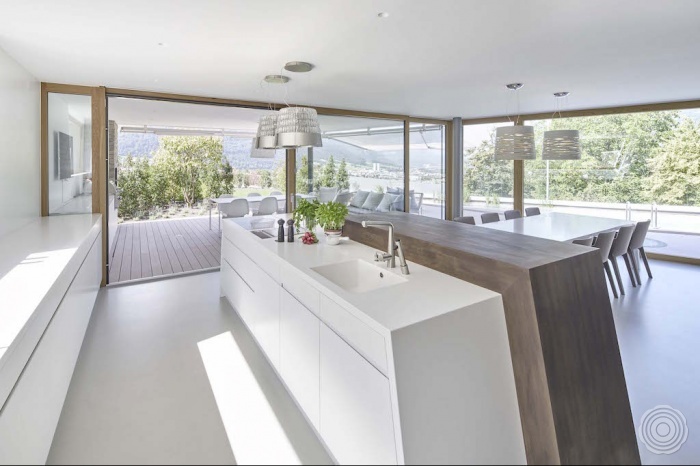 Our resin floors’ seamless surfaces lift every kitchen to a higher level. SENSO kitchen floors are functional and a delight for the eye. Create more unity in your home with a sleek floor. Let your living room’s resin floor extend to the kitchen. SENSO is able to provide you with an entire floor with a seamless surface, so that you can enjoy a beautiful floor while cooking. SENSO kitchen floors are available in every possible colour. SENSO produces the most beautiful colours, using natural pigments. For a unique result, you can even mix two or more colours, giving your kitchen more flair and more style - exactly the way you want it. SENSO develops kitchen floors exactly the way you want them to be. Comfortable, seamless, with a concrete look, like SENSO Fusion. Or how about an extremely durable kitchen floor with a lively look, like SENSO Superquartz. For those who want more peace and quiet and unity, SENSO Pure is the perfect basis. All of our floors are eco-certified and extensively tested for wear resistance and elasticity by TNO. This way, you are always assured of the very best. Easy to clean, dust-free, fire-resistant and completely seamless, so no food residue or other dirt can get between the joints. Pure beauty. A floor that meets the highest hygienic requirements. For both residential kitchens and professional kitchens. Wherever food is prepared, SENSO's kitchen floor provides the right kind of support. Senso HighDensity poured flooring is provided with a strong top layer in order to minimize wear, so that it can also be installed in kitchens. A sleek appearance or poured flooring with concrete look. SENSO develops bespoke high-quality poured floors. Exactly the way you want them. Visit our showroom and experience the advantages of a resin floor in your kitchen. We would be happy to advise you about our kitchens in our showroom, and you can also always contact us by phone or calculate prices online.